Traveling brings me such happiness and a sense of freedom. I adore seeing new places and smelling new scents. Learning about a different culture and way of life is so enriching and is something I enjoy immensely. It is neverending. 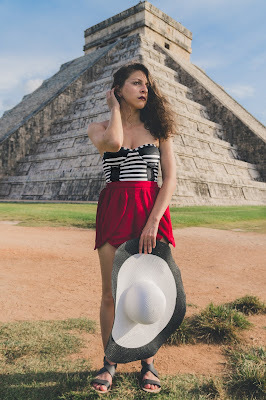 This time I went and visited the Mayan ruins Chichén Itzá in the Yucatán, which is a state within Mexico. I have always wanted to visit and experience these ancient temples and learn about the Mayan's lives. One of the aspects of these buildings that I found to be amazing is that they were made to carry sound across a great distance. The opening at the top is where the priests would speak to a large congregation that would gather around the temple. Our tour guide simply stood in front of the temple and clapped his hands several times. A few moments later a sound would come back and it sounded slightly like the twittering of birds. The whole experience was wonderful. Life for me should always be about learning and experiencing as much as possible. I could never stay stagnant and in one place. My entire soul and being is full of energy that wants to burst free and capture many moments around this world. We only have several blinking, swift moments and I plan to relish in the glory of it all.